The Rider Nation is still buzzing this weekend about the gaffe the Saskatchewan Roughriders committed just before Thursday's 26-19 loss at the Edmonton Eskimos. Rookie linebacker Matt Elam (Florida Gators, Baltimore Ravens) was deemed inelligible to play because his name wasn't included on the Riders' game roster submitted to the CFL. We were alerted in the broadcast booth midway though the first quarter when a CFL official slipped us a piece of paper explaining the oversight. The TSN crew announced it to the nation just a few moments afterwards. 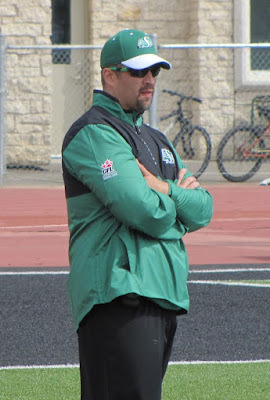 Roughriders Assistant V.P. of Football Operations Jeremy O'Day came on 620 CKRM's SportsCage on Friday to explain the blunder. "It's something that's unacceptable," O'Day said from Buffalo, where he's scouting the NFL Bills training camp. "It's something that rarely happens. Unfortunately for us, we made an error on the roster and we have a check system in place that shouldn't allow that to happen. A roster was turned in with some errors, including a player who wasn't elligible for the game. That's something that's not acceptable for us to do." While Roughriders Head Coach Chris Jones has been taking a tidal wave of heat for the error, O'Day explained that Jones wasn't the culprit. "Chris Jones delegates those responsibilities and trusts people to do their jobs," O'Day reported. "Unfortunately an error was made and it put him in a real tough position to start the game. When you look at it, when you tell a Head Coach one minute before the game that one of his starters can't play, that's obviously a very bad spot to put him in. "To compile it of course, it snowballed when Marc-Olivier Brouillette got hurt on the first play and now you're down two DBs. Chris should be given a lot of credit for how well the defense played, being shorthanded. "So too should the guys on defense for the way they stepped up following that error. It's not something that we can let happen again obviously. We have to pay attention to the details and go through our check system that failed us." The loss to the Eskimos dropped Saskatchewan to 3-4, and 4th-place in the CFL West. O'Day said they've got some work to do to keep up with the heavyweights in the division, most notably Calgary and Edmonton. "There's a lot of things we need to clean up," O'Day mentioned. "We took a lot of penalties. And we need to punch it in when we're in the redzone. But the positives are that Zach Collaros played a great game. He's still getting comfortable with the playbook but it was a great showing by him." "We've gotta win games in our own division. This is a position we've put ourselves in and we have to fight our way out. It starts with Calgary here in Week 10. The guys have a week in between to get energized on the bye, and get ready for a run the rest of the regular season." Why doesn’t the person that made the error just say it was me. I heard on Sportscage. Luc saying if players make mistake own up, should be same for this case. No excuse makes this permissible, this is 100% inexcusable, and should never happen in professional sports. I hope those responsible are held accountable for this egregious error. People have been blaming Chris Jones?? Well, there’s your giveaway folks! It wouldn't even dawn on me to blame Jones. OBVIOUSLY he’s not the one filling out these cards. Anyone trying to blame him for this has just given themselves away as part of the corrupt element in the Regina media. This is the fake news types folks! These are the people who are trying to dishonestly run Jones out of town. And to try something as ridiculous as this they must be desperate. Do not forget who these people are! They will need to be held accountable! Mistakes happen ... to everyone ... made by people. Pro sports are people too.